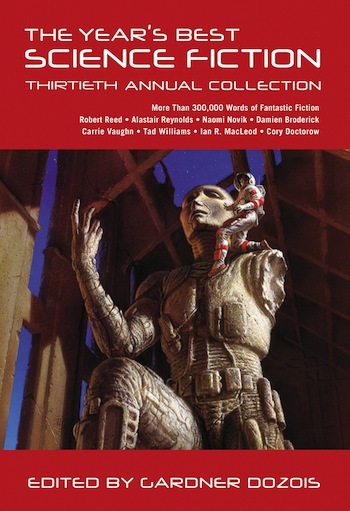 Today, Gardner Dozois’s The Year’s Best Science Fiction: Thirtieth Annual Collection, hits the store. 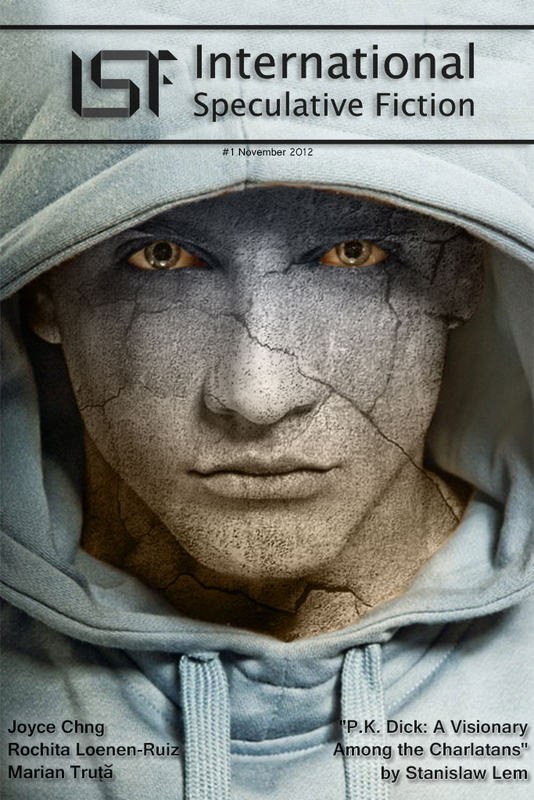 Stories by Lavie Tidhar, Pat Cadigan, Brit Mandelo, Elizabeth Bear, Hannu Rajaniemi and more luminaries of the genre–and it also includes my Xuya continuity story “Ship’s Brother”, originally published in Interzone. Buy now at Amazon.com|Amazon.co.uk|Book Depository. Art courtesy of Richard Wagner (and many thanks to Andy Cox as always). 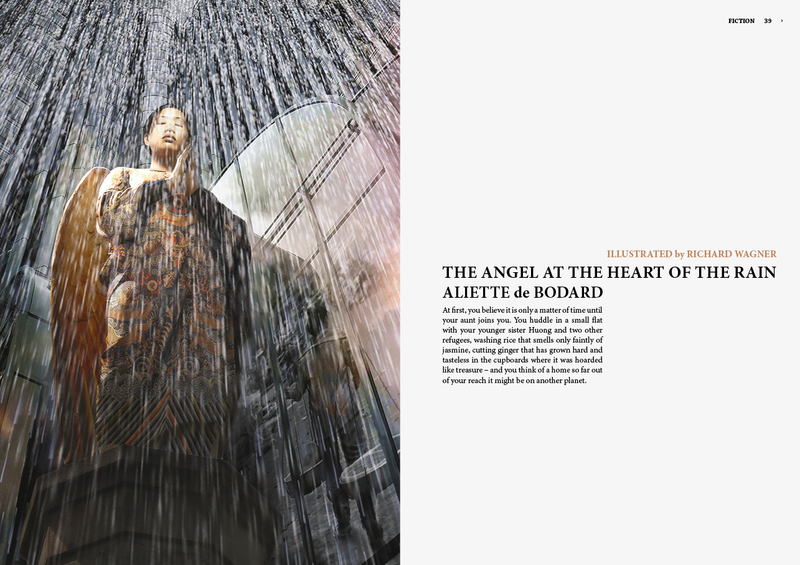 “The Angel at the Heart of the Rain”, my sort-of-magical-realism piece about war and refugees, will be out in the May issue of Interzone. Many thanks to Dom Conlon, Scott Kennedy, Christina Vasilevski and Glen Mehn for the crits–and to the usual suspects Rochita Loenen-Ruiz and Tricia Sullivan for the invaluable encouragement and feedback. Quite happy to announce that “La Mère des Nefs” (lit. “Mother of Ships”, except “nefs” has a grandeur to it that “ship” doesn’t quite have in French…), the French translation of “The Shipmaker” will be appearing in the inaugural edition of Orbs, L’Autre Planète, a cross between a bound book and a magazine (“beau-livre magazine” as they say in French). Many thanks to Maxence Layet and Nathalie Barneix and the rest of the Orbs team for the opportunity and the translation–it’s always fascinating to see the process of translation into another language you speak, and this was no exception. 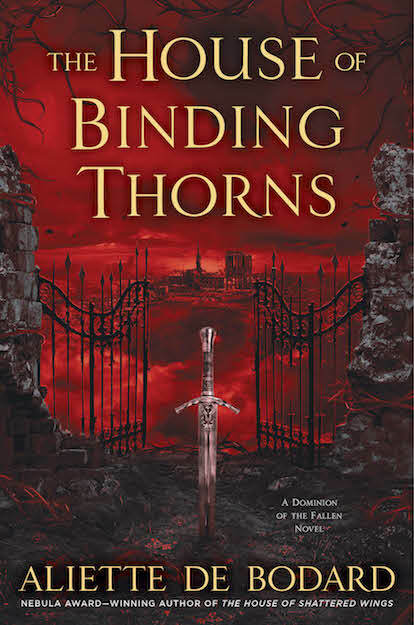 Also, I have seen the galleys, and it all looks quite gorgeous. Looking forward to it! 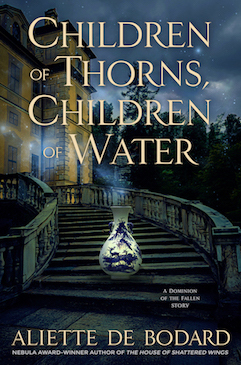 You can find the complete TOC here. 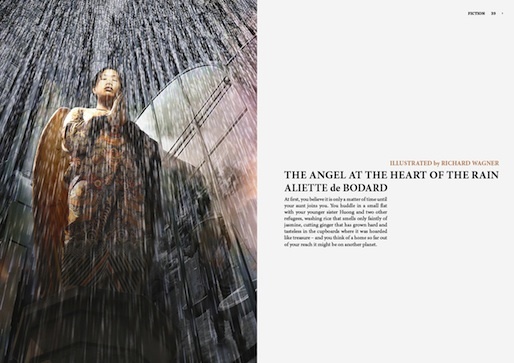 -Received my issue of Interzone, which had “The Flower of Shazui”, a Chen Qiufan story translated by Ken Liu. Very gritty story set in the Shenzhen special economic zone–I really liked the interplay between the characters and the ending, which was sad but fitting. 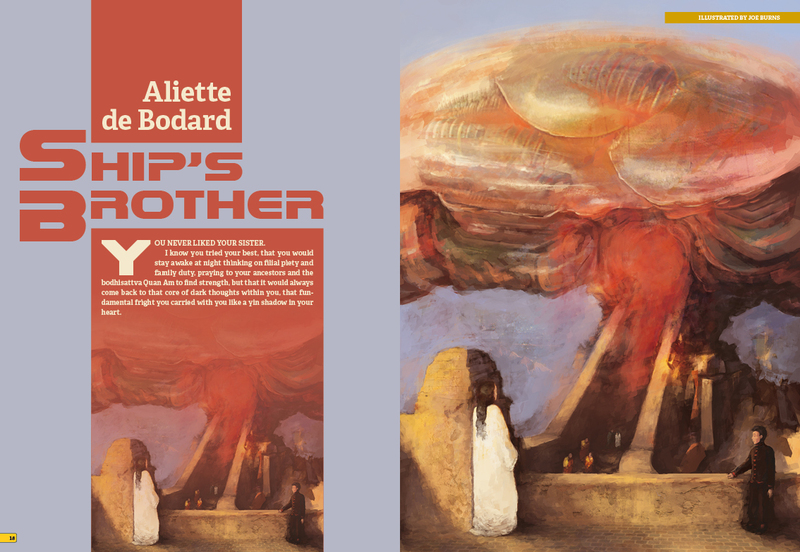 And here’s the artwork by Jim Burns for my story “Ship’s Brother”, which will be in Interzone 241. Full table of contents here (I share a TOC with Gareth L Powell, yay!). I know you tried your best, that you would stay awake at night thinking on filial piety and family duty, praying to your ancestors and the bodhisattva Quan Âm to find strength, but that it would always come back to that core of dark thoughts within you, that fundamental fright you carried with you like a yin shadow in your heart. –“Casa Jaguarului in Umbra”, aka the Romanian version of “The Jaguar House, in Shadow”, is up at the SRSFF website. Many thanks, as always, to Cristian Tamas and to Antuza Genescu for the translation. There is a French version forthcoming in Galaxies as well. -Both “The Jaguar House in Shadow” and “Age of Miracles, Age of Wonders” make the 2010 Tangent Online Recommended Reading list . Lots of familiar names on that list, and plenty good stories too. -I’m guessing by now most people will have seen the Amy Chua piece on the Washington Post, about why Chinese mothers are superior. I don’t have much to say about it other than “batshit crazy Asian mother”–and yes, I have an Asian mother, so I can speak from my (admittedly limited) experience. I can see some of the points, and some things Amy Chua mentions are certainly familiar from my own childhood, though not pushed quite this far. My TV time was limited; so was my video game time; neither of my parents were particularly happy when I brought home bad grades, and yes, both of them always pushed me to go further because they believed I could do better. And I’m glad they did it; I’m glad they placed a higher value on education than on sparing my feelings, and nurtured my ambition and drive–to the point where I thought of doing something as crazy as writing in a second language and getting away with it. But, seriously, not allowing your children to be in school plays, forcing them to play a musical instrument and tormenting your daughter until she gets the piano piece right? Wow. That’s some serious going south here. Allow me to dig up quintessential Chinese wisdom here, in the person of Confucius: “To go beyond is as wrong as to fall short.” Ie, balance and perspective. Something that seems to be missing from all the horror stories about Asian moms (there were quite a few flying around on the internet in the wake of that article). -And, in a lighter vein: Mature people truths (via Cat Rambo). Some of these are oh-so-painfully true. 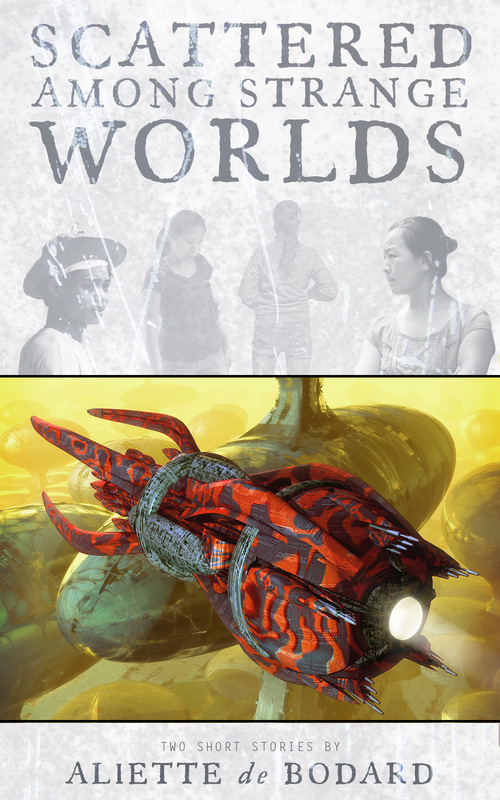 -Finally, I’ve posted (with permission) on the SFWA forums “Alternate Girl’s Expatriate Life”, Rochita Loenen-Ruiz’s awesome story about expatriation, identity and what it means to be an immigrant in a strange land. Recommended by Richard Horton in his year-end summary of Interzone, and generally quite made of awesome. (and I’m not only saying that because Rochita is my friend). Well worth a read if you have forum access. EDIT: apparently, the Amy Chua thing is only an excerpt from a larger book, which is intended to deal with the problems of her education system as well. Mea culpa. EDIT #2: and, apparently, the WJS just quoted the most controversial part of Chua’s book without bothering to add a corrective, because controversy makes for more readers. Great. As I said on LJ, I feel like hitting something, preferably a WJS editor.